American Eagle has some cute stretch cargos as well! They're a bit darker. I love Delias! I love these because even though they are cargos they aren't bulky and wont make my thighs looks humungo. Love love love this pants' design. Ooh, I always like Delia's stuff. J Brand all the way! I'm totally into the Delia's version on this one. For some reason I have a hard time paying over $200 for cargo pants. But it is a trend I'd love to try. The Delia's pant is the perfect price for this trend. Great find, Erika! Delia's version. But holy wow, skinny stretch cargo pants!? I like the Delia's version way better! Loving the Delia's version better! Frugal femme fatale here, darling! Thanks for the fab find! I like the Delia's ones better, the color is much nicer. i'd absolutely go for the delias ones, they look great! delia's! cool find, i've been slowly decreasing my visits there because most of their designs are semi boring but these look chic! 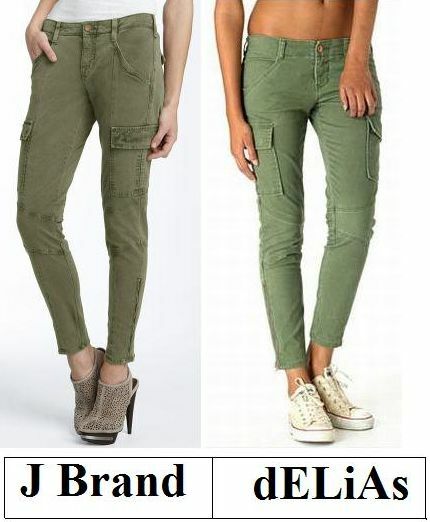 I'd have to feel both to really make a decision as to which is superior, but I can't imagine that the J Brand pair would feel so good as to warrant that crazy price! Best to go with the cute pair from Delia's. Great find, Erika! I love J Brand, but how can you say no to the Delias at a price like that? I love them! I love it! I think I saw a cargo pants look on Blake Lively/Serena in the season finale of Gossip Girl season 3, and I love it so much! can i just say that i have been in love with delias for so long? ever since high school. it's one of the cutest places ever! Delia's always delievers good stuff. Great price too. i love delias pants- they look better. i have a similar pair of pants that i bought for 7 dollars on sale ;) gonna wear them a lot this autumn. I need a new pair. This is so cool! oh goodie. a Delia deal! okay anyway, truth is...i love the color on the delia's. that's a major find erika. LOVE those---totally heading to Delia's tomorrow!! I like the Delia's. I never thought about that green color before, but it looks really good! Ummm, Delia's FOR SURE. I feel like they're more of a trendy piece than an investment. I'm not sure I could pull these off, but great job finding the comparison! I don't know how you do it so well. I am definitely thrifty today. I couldn't bear to pay that much for a pair of casual trousers and they look pretty similar anyway. I think I need the J Brand ones to survive. Seriously: they will be PERFECT for the autumn. I love these posts--you always do such a great job finding a really good (non-cheesy) alternative! Hoping you are staying cool and have a great weekend! I think I would wear either pair! The muted ones for casual Fridays at work, the brighter hue strolling around the city. I love the Houlihan but Delias version actually looks pretty amazing -- love the way it looks with the Converse! And under $50?!? they are both so similar. hm... hard call. Ahh, I love the J Brand one! I caught a pair like that at Zara's last week but unfortunately never got it. I'd love to add something like that to my wardrobe. I still don't think I can really rock the cargo pants look. But the dELiAs pair looks so similar to the J Brand pair. I would definitely save here! I like the delias one too! And I am going to get a pair of skinny cargos for the fall! Wow, great find - the Delia's version is almost a perfect copy of the J Brand one! I love the utilitarian look for this fall, and I might just need to get a pair of these pants (either these or a fabulous khaki-colored pair). I honestly like the delias version more!